We'll, I figure I'll be happy when it's time to go back to work.....having fun is tiring! :) I woke up early today trying to shaking off a bit of dullness in my head. About 3 glasses of water and a couple aspirin did the trick. I was wanting to head up to Manly (in North Sydney, on the beach) since they were having a big Jazz Festival.....but I also needed to get a run in. So I combined the two and headed out to run to Manly. It is a fair way away and I promised myself I'd run for no more that 1.5 hours then walk/bus the rest of the way if necessary. Ended up being only a few K away at the 1.5 hour mark, so I walked the last bit. Got to Manly STARVING so I grabbed some grub and sat on the beach listening to a band play. Hung out in Manly for a couple hours and then hopped on the ferry for the 30 minute ride back to downtown Sydney. After getting cleaned up and a bit of dinner, I headed down to a small concert venue at the Fox Studios complex with the HR Director from Coca-Cola and her daughter and cousin. 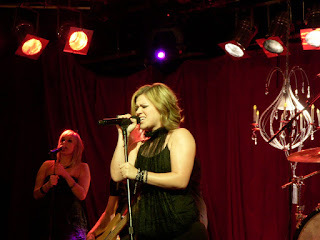 We were there to see Kelly Clarkson (free tickets from work). Literally, the place was PACKED, but it only held maybe 1000 people. We had the 8 year old with us, so the security guy drags us around behind the stage and out the other side to a PRIME area with good views for the shorter little girl. Kelly was in Sydney for Australia Idol, apparently, and decided to do this private show....I'm not sure how you got tickets....they were not available for sale. Anyhow, I stood maybe 10 feet from the stage while she played for about 75 minutes. Good music and performance, and the small venue made the crowds fun! I took a ton of video and pictures....will post a bit later. This weekend was Labor Day in Oz, referred to as the "October Long Weekend". Great timing, as the weather is just stellar. There are tons of festivals, sports events, various other activities in town this weekend! I headed out early Saturday morning and caught the train to Cowan....a town about 40K north of Sydney. 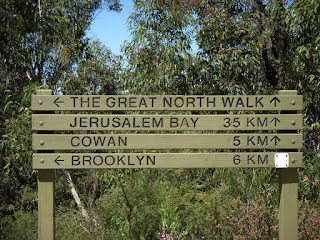 I was planning a 13K hike on part of the "Great North Walk" in Ku Ring Gai Chase National Park and was going to end in the town of Brooklyn. Got up there about 9:45 and hit the trail. Great hike......took about 4 hours (including a nice long stop for lunch and a little book reading). I got to the town of Brooklyn a bit before the start of the Aussie Rules rugby championship game. Hit a local pub in this very small town and watched the first half of the game. It was a blow-out, so I hustled across the road to catch the 4 PM train back to the city. I was supposed to hook up with my mate Dave at the Rose pub. Met Dave and his misses there and we had a couple brews before heading to Sydney Football stadium to watch the Sydney FC football (soccer) game. Excellent game! They got their first home win 1-nil. 4 or 5 of us went over to a local right by the stadium and had a few more brews. Stumbled back home around 12:30 and slept like a baby! Good start to the long weekend! They had a drawing at work this week for some free tickets. I put in for the Kelly Clarkson concert and a live taping of "The Footy Show". We'll, I got the passes to see Kelly but missed out on the Footy Show tickets. Kinda bummed until a girl in the office swung by and said she had no interest in her tickets and I was welcome to them. The Footy Show is basically a mix between ESPN Sports Center, Entertainment Tonight, and Idol all rolled in to one! I watch it most weeks on the TV and was pumped to go. And since the National Rugby League finals are this weekend, this was the "Grand Finale" show for them. A live taping....2.5 hours. Just to make it a bit better, Daughtry (as in Chris, the Idol winner) was playing during the live taping! Show didn't start till 9:30, but you had to be there at 9 to get settled in for the taping. Really cool seeing a live broadcast, and good entertainment too! They had one little skit where two of the guys that have been competing against each other in events on the show all season had their grand final event. They had been doing little competitions all season and were tied 8-8. They started this little course through the audience, drinking hot-peppered milk, putting on costumes, riding Segaway scooters through the aisles, etc. They got to one little station that I couldn't see very well and one of the guys never came back out. Kept wondering what happened to him. Next commercial break they get him back up on stage. Turns out the station had them eating bananas with Wasabi....and he got Wasabi in his eye! OUCH! Fun night.....good hearing Daughtry and another big Aussie singer Jimmy Barnes. Got home way late for a work night....1 AM. All good fun. To be honest, I was a bit worried/nervous about this run. I've had a pretty rough work-week; Arrived from the US Monday AM, straight to the office, and not home most nights till 9:00 PM. Friday I actually got called at 4:45 AM and didn't get home from the office until almost 1:00 AM Saturday morning.....an exhausting 20+ hour day. Not a great start to resting up for the run. The marathon started at 7:15. At about 5:30 AM I called my running bud Dave from the States. 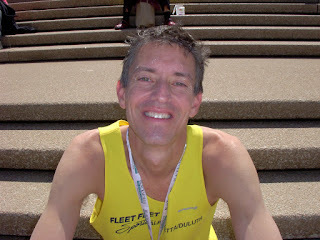 I was trying to rationalize a good strategy given a serious lack of marathon distance training. This was by FAR the most under-prepared I've been for a marathon. Dave and I settled on what is a radical strategy for Jim; join the 3 hour pace group and run steady!!! I left the apartment around 6 and walked the couple kilometers over the bridge to the start. It was chilly, but I didn't want to hassle with a bag check, so I grabbed a trash bag and put it on over my singlet. It proved to not quite provide enough warmth, but I claimed a discarded jumper from the half marathon discard pile and was reasonably toasty till the start (temp was maybe 48 at the gun). I locked in with the pace group at the start. The first 2K required that we climb over the Harbour Bridge.....beautiful but a decent grade up to start the day. As Dave warned, the pace seemed easy. I was super comfortable with the 3:00 pace. Will try to not bore you with all the course details, but; The first half was fairly rolling with some low/medium grade hills but most of them were quite long. But this obviously meant that there were similar long downhill grades as well. I linked up with a guy from the Australian Army and ran most of the first half with him. At a turn-around I realized I'd gotten about 30 seconds ahead of the pace group. I dropped off just a bit and after a couple miles was back with the 3:00 group. Second half was pretty fair. I was still feeling pretty good at the 18 mile mark.....breathing was very easy but my legs were beginning to tire. With about 7K to go the minor suffering began. It was the time I knew would come......one run over 17 miles doesn't equate to proper training for 26 miles. I let the group go but didn't drop off the pace too bad. It was heating up, too....sun was out and it was 65 or so. The last 4K were totally flat and all on my normal running route, so I knew it was in the bag. No cramps, no walking, just a slower pace...the legs just weren't responding. Not sure what the official time will be, but my watch showed 3:03:55. I can honestly say that given my preparation level, sticking with a reasonable pace early made it 3:03 instead of 3:15 or 3:20. If I'd gone out hard the pain would have started much earlier. Dave; thanks for the good advise! Beautiful course, beautiful day..........the only way it could have been better is if I'd had family and friends here to celebrate with. Thanks to all for the well wishes. So, the Sydney Marathon is this weekend. I'll be honest and say I was VERY tempted to switch races to the half when I went to pick up my number yesterday! I'm just not in my best marathon shape....actually not really even in marathon shape at all! I'm really just hoping I can go out and enjoy my first international marathon! It doesn't appear there is live race tracking, but I'm not sure. It is a "chip" event, so maybe they will be posting splits (or at least timely results after the race). The marathon starts Sunday at 7:15 AM with is Saturday at 5:15 PM in Atlanta. Here is the website: http://www.runthebridge.com.au. It should be an interesting run. It starts about a mile from my apartment on the north side of the harbor bridge and finishes at the Opera House. The post-race festivities are in Delane's favorite spot in Sydney....the Royal Gardens! I'll be sure to post some post-race info. Wish me luck! Well, I've had a super time at home in Atlanta for the past week! It's been a bit of an adjustment, as I've been working many nights with the Pacific time zone. But regardless, I've been spending a ton of time catching up with my wife and friends. After a nice Labor day cookout on Monday, we had dinner with Sandra and Doug on Wednesday at my favorite pizza place....Bellas! I ran the river with Ron, Jimmy, Tommy, and Taylor on Thursday......oh how I've missed that run! We then enjoyed some social time at Mellow Mushroom with some brews and grub. Friday was a nice quiet time with Delane and Pasta night! Saturday it was time to catch up with some SEC football. We watched some of the Georgia game with Ron and then headed to Darryl and Kristi's to watch Auburn play. It was tough to see my team loose to a lesser team, but it's football no less! We went to my friend Joe and Shannons sons Owen's first birthday party Sunday. It was really great to see them and a ton of other friends. Delane is taking Monday and Tuesday off....really looking forward to spending some nice time with her. All for now...........next post - back to Sydney on Saturday! I found a slight gap in my schedule in Australia and decided to make a trip to the States! I didn't post prior to going because my sister and I decided it'd be a good opportunity to surprise my mom. My niece's birthday was this past Sunday, so I flew into Charlotte NC on Saturday night (made it just in time to catch the second have of the Auburn game!). My sister had talked my mom into coming up from South Carolina Sunday morning for my niece Grayson's birthday. It was PRICELESS seeing my mom's reaction! She was, to say the least, surprised! She's been so supportive of me while I've been gone (as have all my friends and family) and it was SUCH a pleasure to get to see them and spend time with my niece on her birthday. I met up with Delane on Monday morning. She was up at the lake in NC and my mom dropped me in Spartanburg to meet her. We met a a McDonalds, enjoyed a drink with my mom, then Delane and I walked outside for the drive back to Atlanta to find our car with a flat tire! Classic! So we spent a few extra hours in Spartanburg before driving down Atlanta way.